This was the first stop of our second day. It was only 11 in the morning but we already had our share of adventures. First a morning dip in the rocky Anjuna beach here to be followed by a 10 km bike ride with a 13 kilo backpack on my back to checking in into a different hotel. Our morning was quite something!! Aguada fort is one of the most visited places on Goa. Situated on a hill top on the Sinquerim beach, the Arabian sea can be seen on three sides. There is a lighthouse too and the famous Aguada jail. This fort was built in the early 17 th century, at around 1624. The term Aguada means freshwater spring in Portugese. This fort supplied water to the ships. This Portugese bastion was built to prevent entry into the Mandovi river ( the largest river of Goa) and to prevent potential enemy attacks from the Dutch and Marathas. The dry moat at the entry of the fort. The 13 metre high lighthouse..
Below is the Aguada jail..
beautiful waves at the Candolim Beach.. 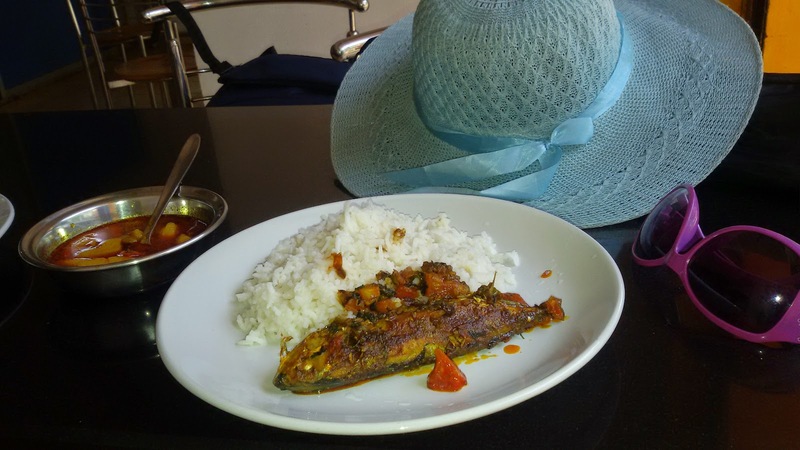 Lunch was nothing fancy, fresh mackerel curry and steamed rice. Beautiful pics. Love you outfit, full of colors!! Look at the waves so amaze by that you guys look stunning and like always know how to have fun and explore. You look marvelous. I love your dress and the heels. Haha only I true fashionista would walk all the way in high heels. The lighthouse looks awesome. I can't believe they have a jail at a beautiful location like that. It's much better than my view haha. Wish you a happy Monday pretty!! Never been here! Beautiful place! I love your dress! what a fun post! your outfit is so cute! love your umbrella! Love the poruguese influence in goa..the lunch looks yummy , ur dress supercute.